Moving in a wheelchair due to disabilities, accidents, or old age can make access difficult. That’s where automatic handicap doors come in to untie your hands. Such doors work with openers, which can be easily installed either in residential or commercial properties. There are choices for external and internal doors and can be combined with electric strikes. You can find several models from different brands and gain complete independence. Handicap door openers come with arms and remote controls. But they also operate via a wall button. Once installed, you can simply press the clicker or wall button to open the door. What’s convenient is that the door in question will also be operated manually. So, if someone wants to open and lock it, there won’t be a problem. Most automatic handicap door operators work with the wall button, remote, infrared devices and more. Many models also operate with an electric door lock strike. The system will enable the door to lock when closed, but it will be released automatically as soon as the opener is activated or if the key is used manually. You can also activate the opener with keyless entry systems. Such openers integrate safety features. So if the door finds resistance, it will stop its opening cycle and return to its closing position. There are openers, which can fit to even small spaces over the door. Since such most openers are installed inside homes or businesses, they have great finishes. Choose based on application – commercial or residential. Don’t forget to mention if this is an interior door or not. It’s also important to get an arm with the right orientation – left/right – depending on how the door opens. Always take measurements, especially the room over the door to make sure the opener fits. 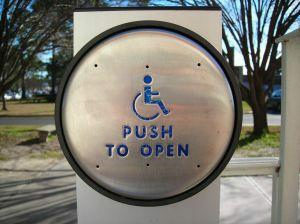 Based on disability, choose the access control convenient to you. Hire a local locksmith to install it for you to be certain it’s set right. In the event of power outage, you will still need the convenience of the opener. So make sure you get one with a backup battery. Make sure the door can stay open for ventilation or other purposes. 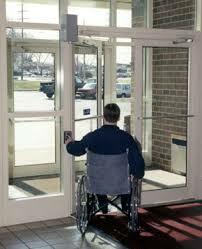 Your life can change as soon as the automatic handicap door opener installation is completed. You don’t have to worry about how easy it would be to open the door or even if it will close behind you. The door will open and shut automatically. And don’t forget that with a keyless entry pad, care providers can have access to your place by simply entering a four-digit code, which can be changed anytime. The most important thing is that you can have the opener remote mounted on your wheelchair but also the choice to use any other device comfortable to you to activate the system. On top of that, you can get clickers that can be pressed with the finger, side of the hand, or the entire palm.